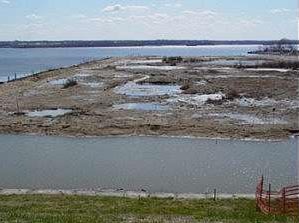 The wetlands adjacent to the Ft. McHenry National Historic Monument and Shrine in Baltimore, Maryland, have been degraded by the removal of regular tidal flushing to the site and by the accumulation of human debris from tidal waters. The area has also been invaded by the common weed, Phragmites australis. When originally constructed in 1982 as mitigation (compensatory restoration) for construction of the Interstate 95 tunnel, the wetlands had three small culverts through the riprap that encircled the site. These culverts allowed for tidal exchange with the adjacent harbor waters. Since then, the culverts have mostly silted in, largely cutting off tidal exchange and fish migration and resulting in the degradation of natural salt marsh function at the site. The wetlands are now being reconstructed with mitigation credits accumulated when a nearby port slip was filled in. The new design should promote regular, natural tidal flooding to the site, control the accumulation of debris, and enhance its habitat value to plant and animal species. The National Ocean Service (NOS) is working in partnership with the National Aquarium in Baltimore to ensure that restoration of the Fort McHenry wetland is successful. The NOS Center for Operational Oceanographic Products and Services (CO-OPS) and the NOS National Geodetic Survey (NGS) are performing the tide and geodetic work for this project. The area's elevation and the gradient of the substrate relative to high-water datums and mean sea level are important considerations of the restoration effort. The NGS conducted kinematic GPS (KGPS) surveys of the site to obtain the existing wetlands surface elevations. The elevations, once referenced to the standard North American Vertical Datum of 1988, were then used to develop a digital elevation model (DEM). Maryland Port Authority used the DEM to design the new wetland in a construction elevation drawing. The ability to overlay various elevation surfaces relative to the tidal datum of Mean Higher High Water (MHHW) was critical to the final design of the wetland's new elevations. The new marsh surface was constructed from February to April, 2004, and Phragmites stands were excavated. Tidal slough entrances are protected by inflatable barriers so that debris will not choke the entrances, although debris may still be a problem during extreme high-water events. Analyses of the frequency and duration of inundation(high waters) for the site were obtained by analyzing data from the long-term water-level station at Baltimore (part of NOAA's National Water Level Observation Network) (NWLON). Biologists at the National Aquarium used this information to determine where and when to plant various species marsh vegetation; planting began in April 2004. NOS installed a tide gauge that will operate for one year, and will perform a post-construction KGPS survey of the wetlands surface to update the DEM. The performance of the newly planted marsh grass and the hydraulic performance and stability of the tidal sloughs and ponds will be closely monitored for the next several years. The effectiveness of the wetlands design will be evaluated continuously, and some minor construction changes are anticipated. The National Aquarium will conduct precise photo time-lapsed monitoring, and will install sediment erosion table (SET) equipment to measure marsh accretion and subsidence. Long-term sea-level trends observed at the nearby NWLON station will be used to estimate relative sea-level trends at the restoration site. The Ft. McHenry Wetlands Restoration Project is already successful from a planning and implementation perspective. This is because water-level analyses and tide and geodetic datum information were applied upfront in the planning stage in the actual engineering drawings, during wetlands construction, and to the strategy for planting the new marsh grass. The success of the wetland's restoration will only be revealed over time; however, application of the full suite of technological capabilities has given the wetlands their best "head start."